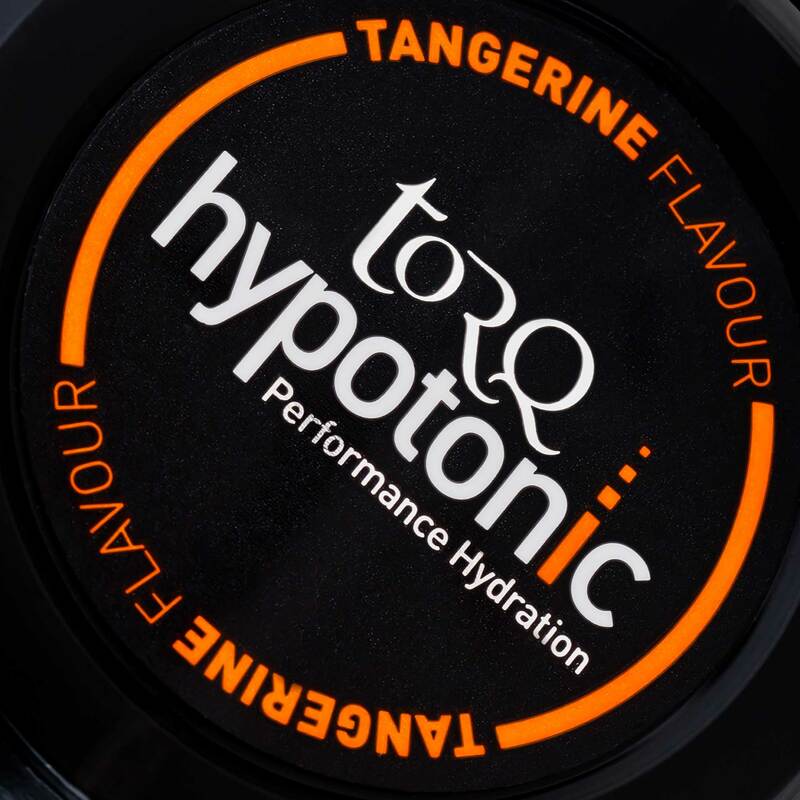 One canister of TORQ Hypotonic contains 6 X 18g individual sticks, each making a 500ml serving of light and refreshing rehydration drink. 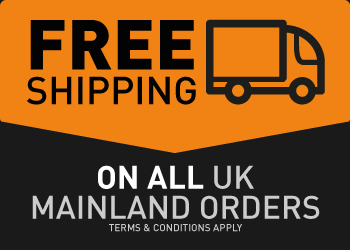 You can purchase any flavour of hypotonic drink from this page. Discounts are applied to any combination of flavours purchased automatically in your shopping cart. TORQ Hypotonic is now sold either as a 3-stick mixed flavour trial pack or in a handy plastic screw-top container, which holds 6 X 18g hypotonic sachets/sticks. Each stick mixes with water to make a 500ml drink, and is specifically aimed at optimising hydration where events/sessions are no more than an hour long, and heavy sweat loss is anticipated. TORQ Hypotonic can also be used as part of the TORQ Fuelling System during longer events, and the handy 6-pack makes carrying your drinks very easy, as it slips nicely into the rear pocket of a cycle jersey or sports bag. Each hypotonic stick contains only 15grams (0.5 TORQ Units) of carbohydrate, so is very light on calories (60 Kcals per 500ml), which means that achieving optimal fuelling for longer durations using this product alone is literally impossible as it would require consuming 2-3 litres of fluid! It is therefore essential that you read and understand the TORQ Fuelling System and consume enough of TORQ’s solid fuelling units (TORQ Gel, TORQ Bar and new TORQ Chew), if you are going to use TORQ Hypotonic as a means of hydration during extensive endurance sessions. Our advice for longer efforts, where fuelling is required as well as hydration, is to use TORQ Energy as your drink source, because the isotonic nature of this product will provide a better balance between fuelling and hydration – that said, the choice is clearly yours, as long as you understand that your goal in the endurance scenario is to consume 2-3 TORQ Units per hour. Some people will prefer the lighter flavour and mouthfeel of TORQ Hypotonic, and that’s fine as long as you understand the rules! TORQ Hypotonic is supplied in a robust handy plastic screw-top canister containing 6 X TORQ Hypotonic sticks. Each stick makes 500ml of TORQ Hypotonic (3 litres per pack). Tear the corner off the TORQ Hypotonic stick and pour contents into 500ml of water. If using a 500ml bottle, be sure to leave a small amount of air space to facilitate mixing. Shake vigorously. Don’t add water to powder, add powder to water. For any drink/solution to be effective in hydrating us, it must be rapidly absorbed into the body. One of the main factors affecting how quickly solutions are absorbed, is the speed at which it can move across the wall of the small intestine and into the blood stream. Fluids are absorbed into the body almost exclusively in the small intestine, via two main mechanisms; passive transport, and facilitated transport. 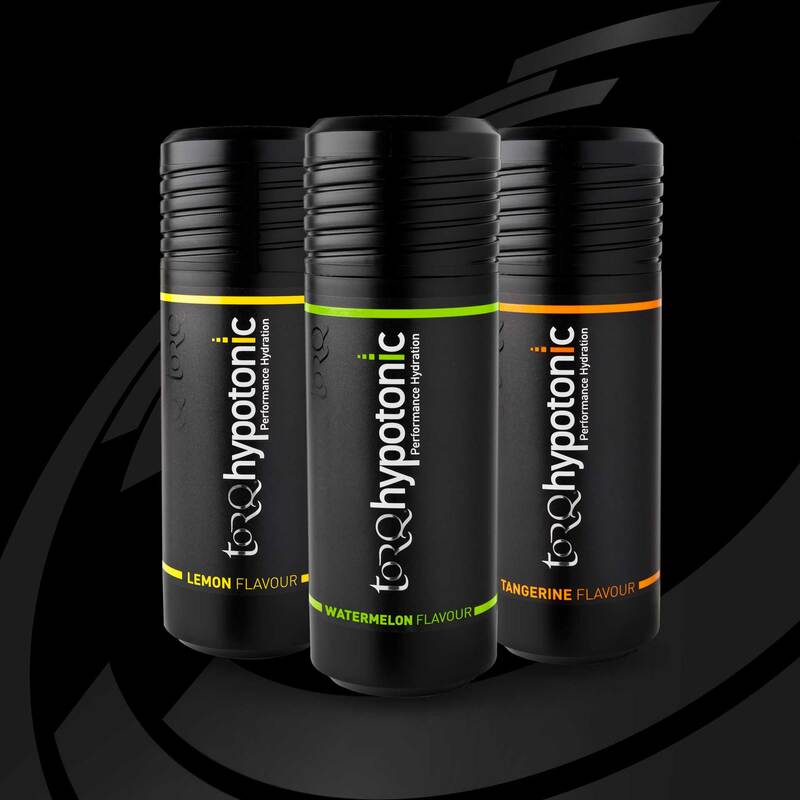 A hypotonic solution represents the fastest possible way to hydrate: In situations where perspiration rates are extremely high over short periods of exercise (up to 60 minutes), including indoor turbo/gym interval sessions, spinning classes and short competitions in extreme heat, hydrating with TORQ Hypotonic will deliver superior performance over any other fuelling/hydration strategy. A hypotonic solution offers significant benefits over electrolyte tablets: We have been particularly vocal on this website about the misselling of electrolyte tablets for a variety of reasons. Please take the time to click HERE to read our very popular article. In summary, we complained about the fact that these tablets don’t do what the user might perceive they’re going to do. They contain ZERO carbohydrate, so can only provide a passive transport mechanism for hydration. As demonstrated above, carbohydrate is required to engage facilitated transport. The fact that the electrolyte tablets contain no carbohydrates, means that they need to be artificially sweetened, which we at TORQ are heavily opposed to. They also contain effervescent agents, which aren’t required if the drink is supplied as a powder rather than a tablet. Many drinks, including these tablets, also contain colours, which we also refuse to entertain at TORQ. Our main complaint about the marketing of electrolyte tablets was and still is that zero carbohydrate means zero fuelling benefit and this isn’t being made clear to customers in our opinion. TORQ Hypotonic contains 15g of multiple-transportable carbohydrates (60 Kcals) per serve. We make it abundantly clear that this isn’t enough to optimally fuel for longer performances (one would need to drink 3 litres of it to fuel optimally) – it is however a lot better than zero carbohydrate. In summary, electrolyte tablets won’t hydrate you very well, or fuel you at all and contain sweeteners, so what do they actually do? If hydration is your overriding goal, use TORQ Hypotonic, because it works. If you are exercising for longer than an hour, or have a heavy training schedule, consult the TORQ Fuelling System and choose products that are appropriate for your objectives. You can always drop us a line, or pick up the phone and talk to us if you’re confused, it’s all part of the service we offer. In case you were wondering, pure water is a particularly poor hydrator. Plain water causes bloating due to poor absorption and also suppresses the thirst reflex, leading to decreased desire to drink. It also stimulates urine output and is therefore, inefficiently retained within the body. The carbohydrate and electrolytes in TORQ Hypotonic overcome all of these problems. TORQ Energy utilises a 2:1 blend of glucose-derivatives and fructose founded on a now substantial body of peer-reviewed published research (see bottom of this page for details). The carbohydrate sources for TORQ Hypotonic come from dextrose (2 glucose molecules bonded together) and fructose. This dual-delivery carbohydrate formulation has been proven beyond doubt to supply energy faster than any other combination of carbohydrates or single carbohydrate source formulations. Take a look at the two very short movie clips below, which demonstrate how 2:1 Glucose-Derivatives:Fructose deliver over 40% more carbohydrate to the blood per hour than single glucose sources (the next best option). Nutritional Information for all flavours of TORQ Hypotonic are supplied under this tab. Ingredients: Dextrose, Fructose, Citric Acid, Natural Flavouring (3%), Electrolytes (Sodium, Chloride, Calcium Lactate, Potassium Chloride, Magnesium Carbonate). Allergen-Free: No gluten containing ingredients used. Please note: The nutritionals stated per 500ml to 1000ml are mixed at the recommended 3% hypotonic solution. The 100g figure represents the nutritional content of the dry powder before mixing. 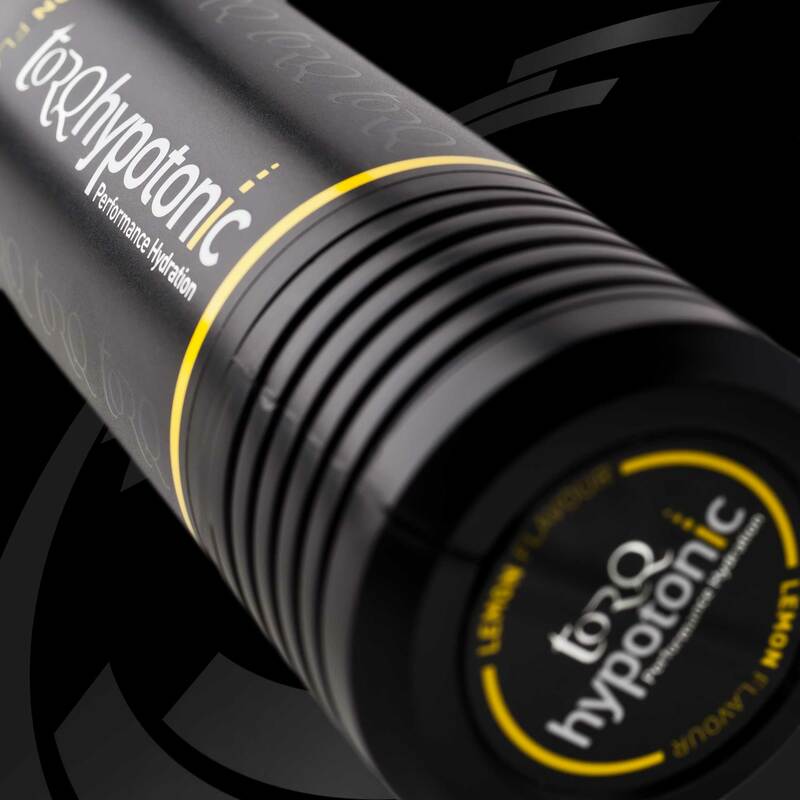 TORQ Hypotonic is available in robust canisters containing 6 X 18g sticks (each stick makes 500ml). Optimal Composition of Fluid-Replacement Beverages. Comprehensive Physiology, 4:575-620. The human Na+/glucose cotransport is a molecular water pump. Journal Physiology. 508:15-21. Small bowel review: Normal Physiology Part 1. Dig Dis Sci. 46(12):2567-87. Water and solute absorption from carbohydrate-electrolyte solutions in the human proximal small intestine: a review and statistical analysis. Int J Sport Nutr Exerc Metab, 20(5), 427-42. Cotransport of water by the Na+/glucose cotransporter. Proceedings of the National Academy of Sciences, 93(23), 13367-13370. Jeukendrup, A.E. (2010). Carbohydrate and exercise performance: the role of multiple transportable carbohydrates. Curr Opin Clin Nutr Metab Care. Jul;13(4):452-7. Rowlands, D.S., Houltham, S., Musa-Veloso, K., Brown, F., Paulionis, L., Bailey, D. (2015). Fructose-Glucose Composite Carbohydrates and Endurance Performance: Critical Review and Future Perspectives. Sports Med. Nov;45(11):1561-76.